Globally, diabetes represents the 3rd and 10th leading cause of loss of years of potential life among women and men, respectively. The recent estimates by the International Diabetes Federation showed that the number of adults affected by the disease in 2011 was 366 million which was projected to increase to 552 million by 2030. Among the top 10 countries/territories with the largest number of diabetic adults, five are in Asia. China tops the list with 90.0 million followed by India which has 61.3 million persons affected by diabetes. The numbers are estimated to rise to 129.7 million and 101.2 million, respectively, by 2030.,, Keeping in view the alarming increase in the incidence and prevalence of diabetics in India, the WHO has declared India as the diabetic capital of the World. Risk for Type 2 diabetes mellitus (T2DM) rises with increasing age and is further elevated in certain racial and ethnic groups, including Asians, Native Americans, and Pacific Islanders., However, while race, age, genetic predisposition, and other nonmodifiable factors are important in the pathogenesis of T2DM, lifestyle factors, particularly physical inactivity, over nutrition, and related obesity, are thought to be primarily responsible for the current global diabetes epidemic. Other contributing lifestyle-related factors include chronic stress, impaired sleep, and smoking.,,, In fact, lifestyle factors may account for 90% of incident diabetes cases  and are significant predictors of T2DM-related complications and mortality. Thus, a central element of T2DM care is lifestyle management, which is considered critical to the prevention of acute complications and the reduction of risk for long-term complications. A central goal in T2DM management is the reduction of blood glucose levels and improves lipid profile, which has been shown to reduce risk of microvascular and possibly certain other complications. The characteristic features of diabetic dyslipidemia are high plasma triglyceride (TG) concentration, low high-density lipoprotein (HDL) concentration, and increased concentration of small dense low-density lipoprotein (LDL) particles. Insulin resistance leads to increased flux of free fatty acids and hence the lipid changes. In light of the above, identifying sustainable lifestyle interventions with the potential to improve multiple factors of relevance to the management of T2DM are of clear importance. Mind–body practices such as yoga, which capitalizes on the ability of the mind to enhance physical health (and vice versa), appear particularly suited for addressing multifactorial conditions. Yoga is a traditional mind–body system originating in India over 4000 years ago. In recent decades, the practice of yoga has been rising in both developed and developing countries worldwide , and the field of yoga therapy is now growing rapidly. Yoga therapy is a relatively novel and emerging clinical discipline within the broad category of mind–body medicine and burgeoning popularity worldwide as alternative medicine. Yoga is a form of physical activity consisting of various postures (asana) and breathing techniques (pranayama). It is generally safe, is simple to learn, and can be practiced by even ill, elderly, or disabled individuals. Yoga has been shown to have therapeutic benefits for individuals with a wide range of health conditions., It seems that yoga improves psychological conditions to manage stress, reduce anxiety and negative emotions, and increase positive emotions, and achieve emotional balance. Previous findings ,, suggest that yogic practices may promote significant improvements in several indices of importance in T2DM management, including glycemic control, lipid levels, and body composition. The importance of nondrug or lifestyle management and the need to educate patients, families, communities, and health care workers are stressed. In view of these observations, the present study was undertaken to assess the effect of 12 weeks yogic intervention on blood sugar and lipid profile in elderly women with T2DM. The present study was carried out in two old age homes, namely, Debrup Nibas and Urmila Bridhashram, Kalikapur Colony, Bolpur, Birbhum, West Bengal, India. Initially, twenty-three interested sedentary women whose age range was 55–70 years (mean 64.55 years) were selected from the above-mentioned two old age homes as subjects in this experimental study. They were nonsmokers and postmenopausal (absence of menses for >2 years). Participants were scheduled for screening visit to determine their eligibility for participation. During screening visit, written informed consent was obtained from the participants as well as from the management authority of the old age home. Their health history were also collected from the home and reviewed to ensure qualification for the study. Blood samples were collected, for assessment of fasting blood glucose. 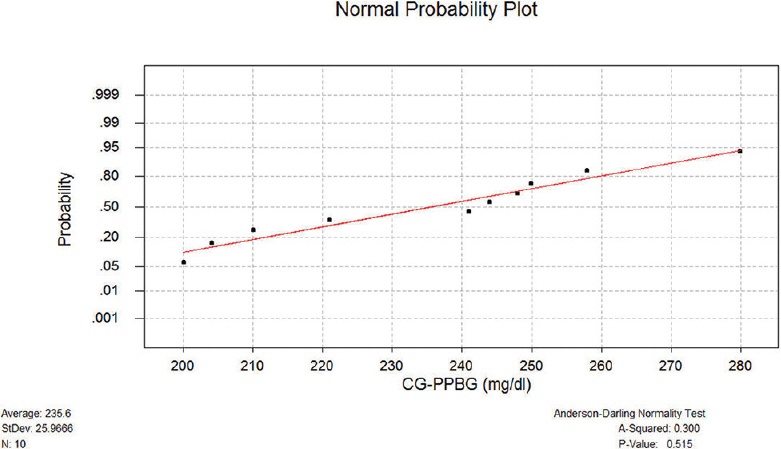 This was followed by a 2 h oral glucose tolerance test for estimate postprandial blood sugar (PPBS). Participants were excluded from the study if they had no history of T2DM. Recruited participants were given a medical and physical examination by a qualified physician for determining medically and physically fit to participate in the study. Three participants were excluded from the study during screening visit. Finally, twenty (n = 20) participants who fulfilled the inclusion criteria and passed the baseline medical and physical examination were randomly divided into two groups, i.e., yogic intervention group (YIG) and wait-listed control group (CG). Both groups consist of equal number of participants [Figure 1]. All the participants lived in the old age home for more than 2 years and were provided similar diets, in terms of caloric intake and nutrients, controlled by a nutritionist, so it will not be wrong to assume their dietary habits and socioeconomic statuses were similar. There was no difference in routine life pattern and they all led a sedentary lifestyle; hence, the participants were considered as a homogeneous group. To make the participants involve themselves in the yoga training program, an orientation class was arranged. The researcher has explained the purpose of the study to the participants and their part in the study. Five sessions were spent to familiarize the participants with the technique involved to practice of yoga. The participants of YIG were verbally motivated to attend the training sessions regularly. Further, the CG was specially oriented and advised to avoid the special practice till the end of the experimental period. The participants of experimental group were sufficiently motivated to perform their maximal level during yogic intervention. Chronological age, standing height, body weight, body mass index (BMI), fasting plasma glucose (FPG), PPBS, total cholesterol (TC), TG, LDL, very LDL (VLDL), and HDL were measured for this experimental study. All the data were collected according to the guidelines of standard scientific manual. Instruments were calibrated every day before the experiment. Before the start of experimental treatment, all twenty participants underwent baseline testing (pretest) for the assessment of their blood sugar (FPG and PPBS) and lipid profile (TC, TG, LDL, VLDL, and HDL). To meet the purpose of the study, both the YIG and CG participants were assessed after 6 weeks (mid-test) and 12 weeks (posttest) accordingly. For mid-test and posttest, blood samples of the experimental group were collected 48 h and 72 h after the last training session, respectively. The “Board of Studies,” Department of Physical Education, Visva-Bharati University, went through the whole procedure of this study and forwarded this to the institutional (university) research board. Finally, the university research board approved the study. The yoga training programme was performed under the supervision of a qualified yoga therapist and no serious adverse effect was reported by the subjects. The dropped-out cases were eliminated for the following reasons: 2 cases no history of T2DM and another one could not qualified physical fitness test as she was broken her leg that time. The yogic intervention was given to YIG for 12 weeks of one session in the morning for three alternative days on Monday, Wednesday, and Friday under the supervision of a qualified yoga therapist. Training volume and intensity were increased progressively in 5th and 9th weeks. 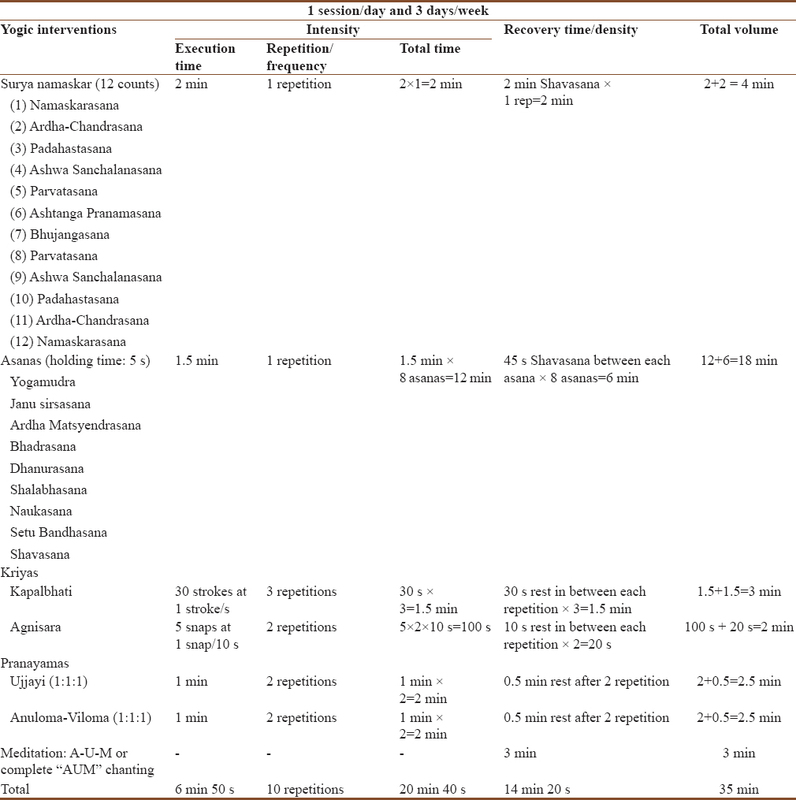 The details of yogic intervention training protocol are presented in [Table 1], [Table 2], [Table 3]. All the statistical calculations were done with the help of SPSS Statistics for windows, version 17.0. (Chicago: SPSS Inc.) To find out the mean and standard deviation of the selected variables, descriptive statistics were employed. 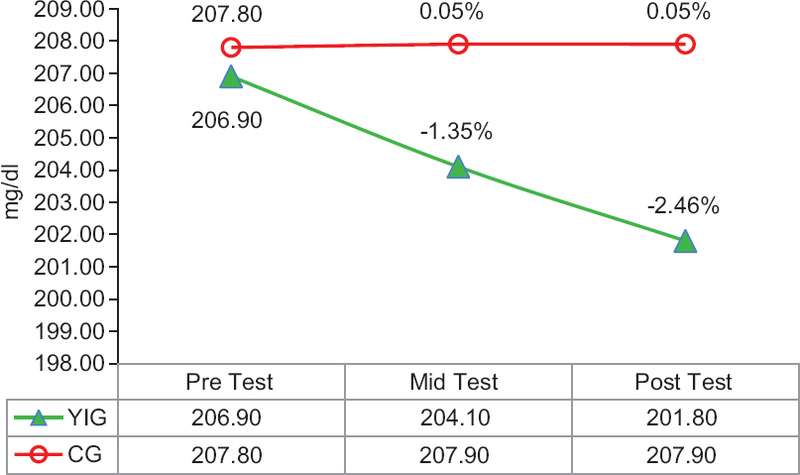 For the analysis comparing the quantitative variables between pretest versus mid-test and pretest versus posttest, paired t-test was employed for each group individually. To find out the effects of yoga on lipid profiles of elder women with T2DM, the analysis of covariance (ANCOVA) was used and the F-ratio was find out. Whenever the F-ratio was found significant, least significant difference (LSD) post hoc test applied to determine which of the paired means difference was significant. The demographic and anthropometric characteristics of the participants in each group are presented in [Table 4]. Age, height, weight, and BMI were not significantly different between the groups. 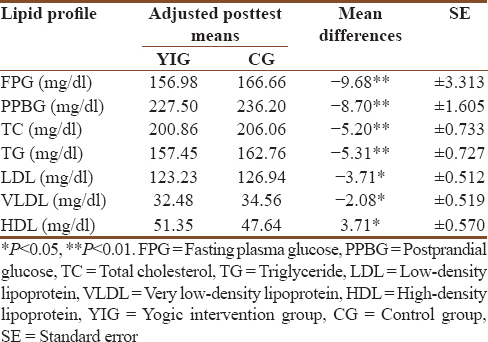 In the present study, the blood sugar and lipid profile were significantly changed in YIG after 6-week and 12-week yoga practice when compared to baseline, whereas no such changes were observed in CG [Table 5]. 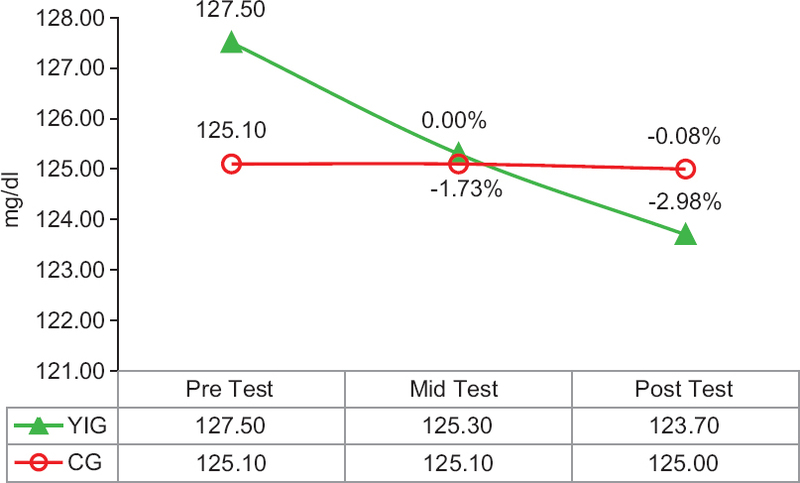 The changes were recorded by decreasing the TC 1.35% after 6 weeks (P < 0.01, paired t-test, pretest vs. mid-test) and 2.46% after 12 weeks (P < 0.01, paired t-test, pretest versus posttest) in YIG as compared with the baseline value [Figure 2]. 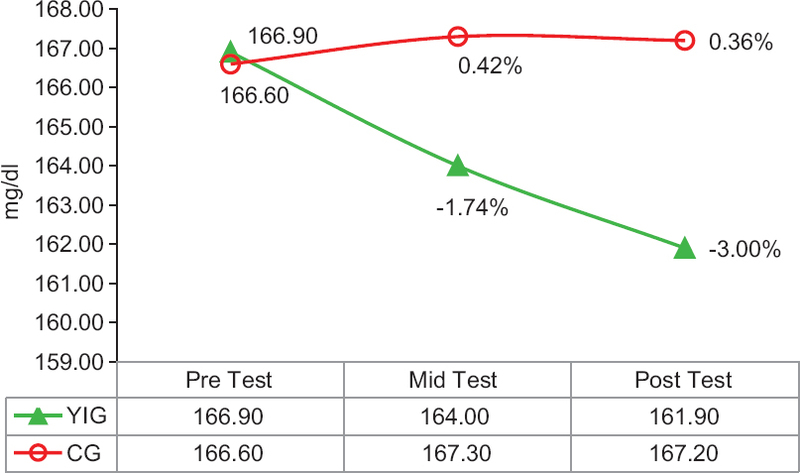 In case of TG, LDL, and VLDL, the decrease also recorded as 1.74%, 1.73%, and 5.06% after 6 weeks (P < 0.01, paired t-test, pretest vs. mid-test) and 3.00%, 2.98%, and 8.15%, respectively, after 12 weeks (P < 0.01, paired t-test, pretest vs. posttest) in YIG as compared with the baseline value [Figure 3], [Figure 4], [Figure 5]. 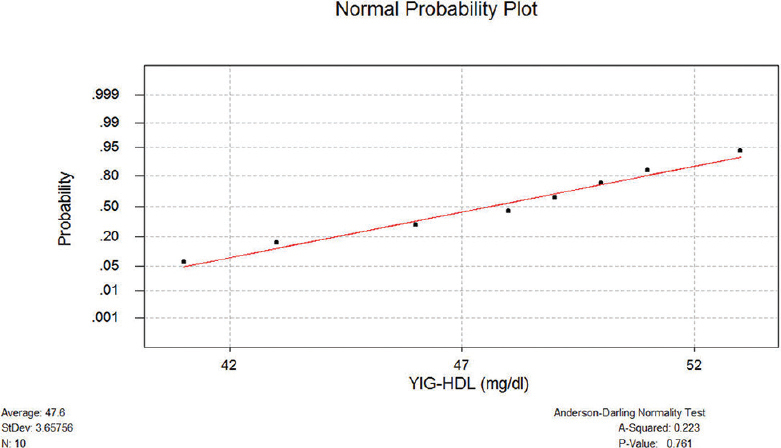 The improvements of HDL were recorded 3.36% after 6 weeks (P < 0.01, paired t-test, pretest vs. mid-test) and 7.56% after 12 weeks (P < 0.01, paired t-test, pretest vs. posttest) in YIG as compared with the baseline value [Figure 6]. Normality of each variables were tested and the results are presented in [Figure 7] to [Figure 8], [Figure 9], [Figure 10], [Figure 11], [Figure 12], [Figure 13], [Figure 14]. From [Table 5], using ANCOVA, the F-ratio for adjusted posttest means in FPG and PPBS of the participants was 4.17 and 7.56, which was significant at 0.05 and 0.01 level, respectively. 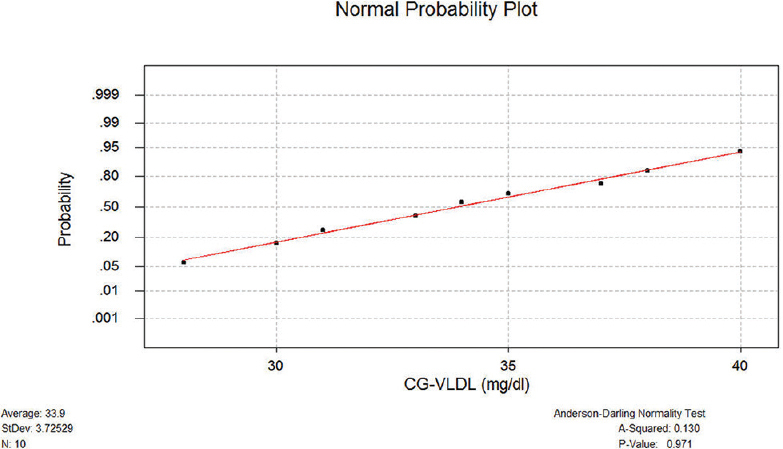 When comparing the adjusted posttest means between YIG and CG, following outcomes had a 0.01 significance level: TC, TG, LDL, and VLDL decreased while HDL increased. 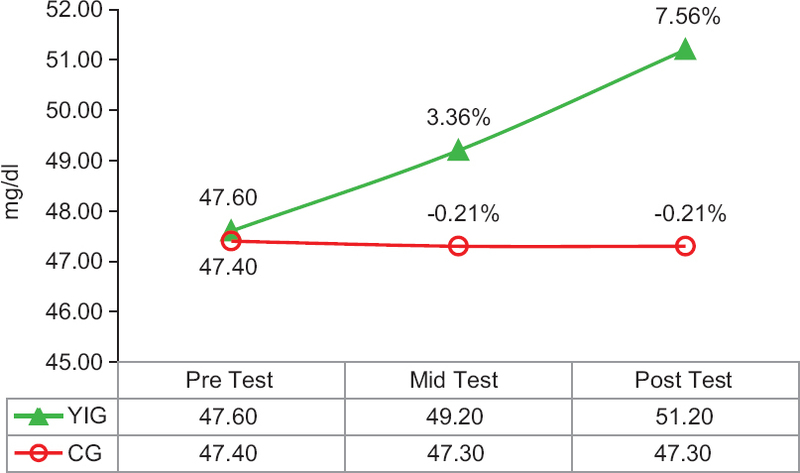 The above analysis of the data indicated that there were a significant difference in the adjusted posttest means between YIG and CG. Further, to determine which of the paired means had a significant difference, the LSD post hoc test was applied and the results are presented in [Table 6]. The present study was aimed at studying the effect of yogic intervention on blood sugar and lipid profile in elderly women with T2DM for 3 months. The yogic intervention in these patients resulted a decrease in FPG, PPBG, TC, TG, LDL, and VLDL and an increase in HDL. The results show that following 12 weeks of yogic intervention significant decreases in FPG and PPBG values in YIG when compared to CG. Similar findings were found by Vaishali et al., Singh et al., and Upadhyay et al. Likewise, Mondal et al. and Saha. also reported beneficial effect of yoga practice on FPG, PPBG, and lipid profile in participants with T2DM. In this study, maintaining all the methodological formalities, except randomized control trial, again, it was observed that yogic intervention (both 6 and 12 weeks) has significant beneficial effects on T2DM by improving lipid profile in elder women. In the yogic intervention schedule, there were Surya namaskar (Sun salutation) and asanas (physical postures) which were reported as moderate aerobic type of exercises  and may positively influence the lipid profile. There are many exercise and sports scientists who have reported the same that regular moderate exercise habit may improve lipid profile, which positively support our findings also. The significant decreases in TC, TG, LDL, and VLDL values coupled with significant increase in HDL in our participants imply an improved lipid profile having good prognostic value. This decrease of “bad” cholesterol and a concomitant increase in “good” cholesterol have significance when viewed in light of the cardiovascular risk profile of diabetic patients. A systematic review study done by Innes and Vincent  reported that yoga improves lipid profile by reducing TC, TG, LDL, and VLDL and increasing HDL. The findings of the present study are comparable with the report of their review. Yogic intervention effect, changes in biochemical and hormonal profile, elimination of stress, and instilling a sense of discipline. 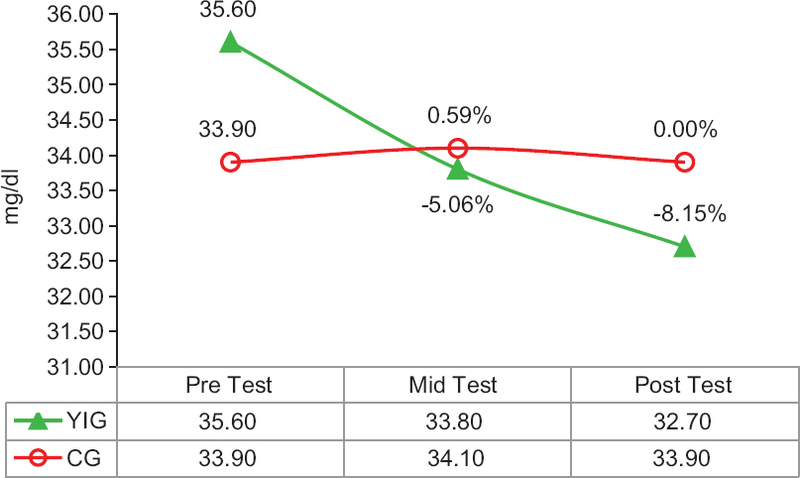 These changes suggest improvement in the insulin sensitivity following yogic intervention. In all of mentioned studies,,,,, yoga showed favorable outcomes among patients with T2DM. The physicians and health administrators should emphasize and plan about how yoga could effectively be taught as a therapeutic intervention among public. This study has confirmed the useful role of yoga in the control of T2DM. 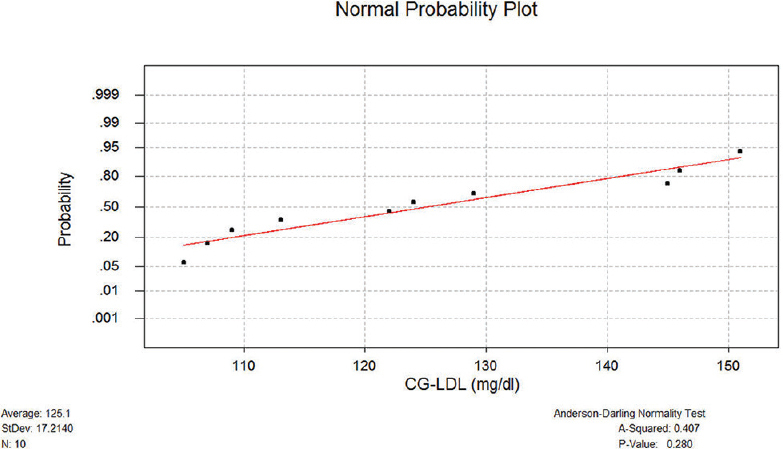 FPG, PPBS, and bad cholesterol levels came down significantly, whereas good cholesterol increased significantly. Based on our results, it can be said that yoga is a nondrug, noninvasive, and cost-effective method which has therapeutic intervention and protective effects on blood sugar and lipid profile of elderly women. The beneficial effects of yoga as seen in this study may be assumed that adoption of yoga on long-term basis would bring proper control of blood sugar and lipid profile level in elderly women with T2DM. However, considering the small sample size, limited methodology, and the potential heterogeneity, further extensive, large-scale, and long-term studies are necessary to support our findings. WHO. Managing diabetes in primary care in the Caribbean. Barbados: Pan American Health Organization; 2006. Unwin N, Whiting D, Guariguata L, Ghyoot G, Gan D. The IDF Diabetes Atlas. 5th ed.. Brussels, Belgium: International Diabetes Federation; 2011. p. 7-12. Gupta R, Misra A. Type 2 diabetes in India: Regional disparities. Br J Diabetes Vasc Dis 2007;7:12-6. Joshi SR, Das AK, Vijay VJ, Mohan V. Challenges in diabetes care in India: Sheer numbers, lack of awareness and inadequate control. J Assoc Physicians India 2008;56:443-50. Ramachandran A, Snehalatha C, Shetty AS, Nanditha A. Trends in prevalence of diabetes in Asian countries. World J Diabetes 2012;3:110-7. Gupta V. Diabetes in elderly patients. JK Pract 2002;91:258-9. Yoon KH, Lee JH, Kim JW, Cho JH, Choi YH, Ko SH, et al. Epidemic obesity and type 2 diabetes in Asia. Lancet 2006;368:1681-8. Zimmet P, Shaw J, Murray S, Sicree R. Diabetes: An epidemic in full flight: Forecasting the future. Bull Int Diabetes Fed 2003;48:12-6. Hu FB. Globalization of diabetes: The role of diet, lifestyle, and genes. Diabetes Care 2011;34:1249-57. Barone MT, Menna-Barreto L. Diabetes and sleep: A complex cause-and-effect relationship. Diabetes Res Clin Pract 2011;91:129-37. Cappuccio FP, D'Elia L, Strazzullo P, Miller MA. Quantity and quality of sleep and incidence of type 2 diabetes: A systematic review and meta-analysis. 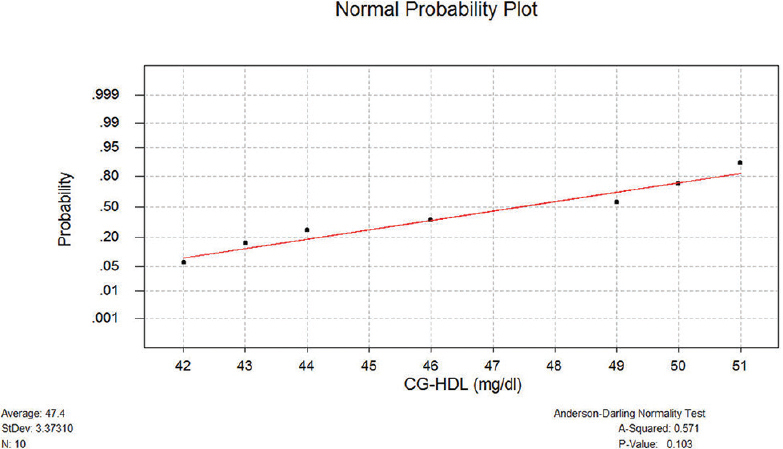 Diabetes Care 2010;33:414-20. Chen L, Magliano DJ, Zimmet PZ. The worldwide epidemiology of type 2 diabetes mellitus – Present and future perspectives. 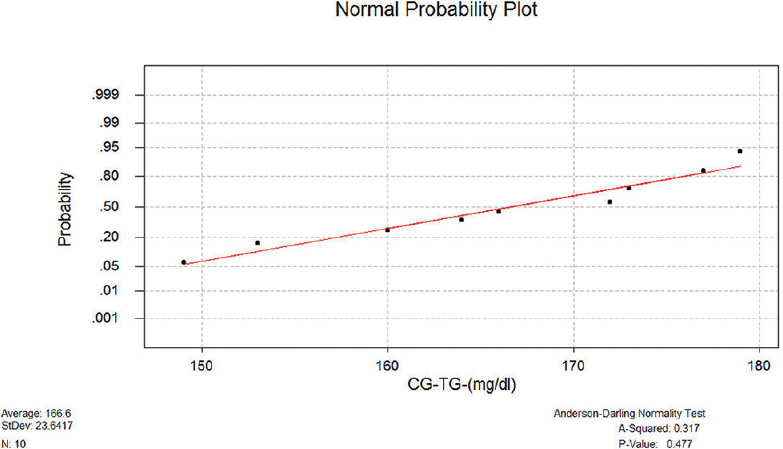 Nat Rev Endocrinol 2011;8:228-36. Lin CC, Li CI, Liu CS, Lin WY, Fuh MM, Yang SY, et al. Impact of lifestyle-related factors on all-cause and cause-specific mortality in patients with type 2 diabetes: The Taichung Diabetes Study. Diabetes Care 2012;35:105-12. Fowler MJ. Microvascular and macrovascular complications of diabetes. Clin Diabetes 2011;29:116-22. Fishman L, Saltonstall E. Yoga in pain management. In: Integrative Pain Medicine: The Science and Practice of Complementary and Alternative Medicine in Pain Management. Totowa, New Jersey: Humana Press; 2008. p. 259-84. Chappie CK. Modern yoga. Relig Stud Rev 2008;34:71-6. Jeter PE, Slutsky J, Singh N, Khalsa SB. Yoga as a therapeutic intervention: A bibliometric analysis of published research studies from 1967 to 2013. J Altern Complement Med 2015;21:586-92. Singh S, Malhotra V, Singh KP, Madhu SV, Tandon OP. Role of yoga in modifying certain cardiovascular functions in type 2 diabetic patients. J Assoc Physicians India 2004;52:203-6. Bernardi L, Sleight P, Bandinelli G, Cencetti S, Fattorini L, Wdowczyc-Szulc J, et al. Effect of rosary prayer and yoga mantras on autonomic cardiovascular rhythms: Comparative study, in 323 (22-29 December 2001). p. 1446-9. Carlson LE, Speca M, Faris P, Patel KD. One year pre-post intervention follow-up of psychological, immune, endocrine and blood pressure outcomes of mindfulness-based stress reduction (MBSR) in breast and prostate cancer outpatients. Brain Behav Immun 2007;21:1038-49. Raub JA. Psycho-physiologic effects of hatha yoga on musculoskeletal and cardiopulmonary function; a literature review. Altern Ther Health Med 2000;6:55-63. Mitra A, Dewanjee D, Dey B. Mechanistic studies of lifestyle interventions in type 2 diabetes. World J Diabetes 2012;3:201-7. Shantakumari N, Sequeira S, El deeb R. Effects of a yoga intervention on lipid profiles of diabetes patients with dyslipidemia. Indian Heart J 2013;65:127-31. Vaishali K, Vijaya K, Adhikari P, Unni Krishnan B. 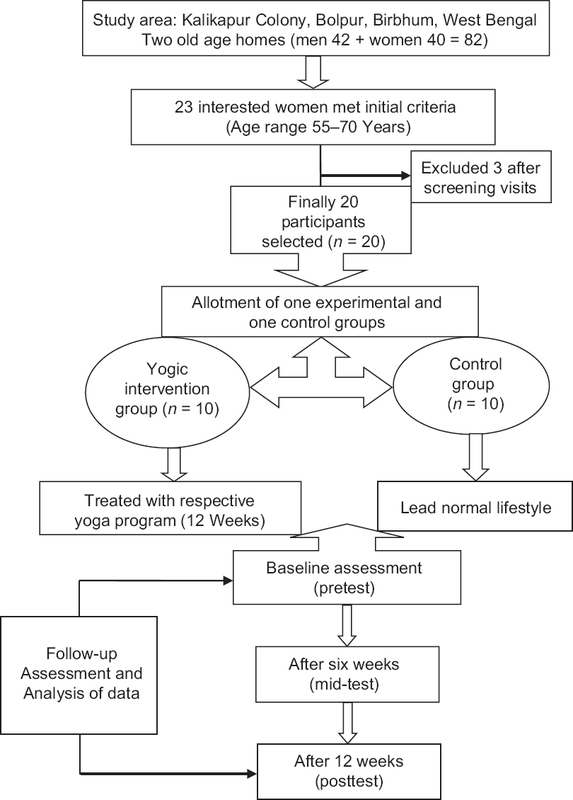 Effects of yoga-based program on glycosylated hemoglobin level serum lipid profile in community dwelling elderly subjects with chronic type 2 diabetes mellitus – A randomized controlled trial. Phys Occup Ther Geriatr 2012;30:22-30. Upadhyay A, Balkrishna A, Upadhyay RT. 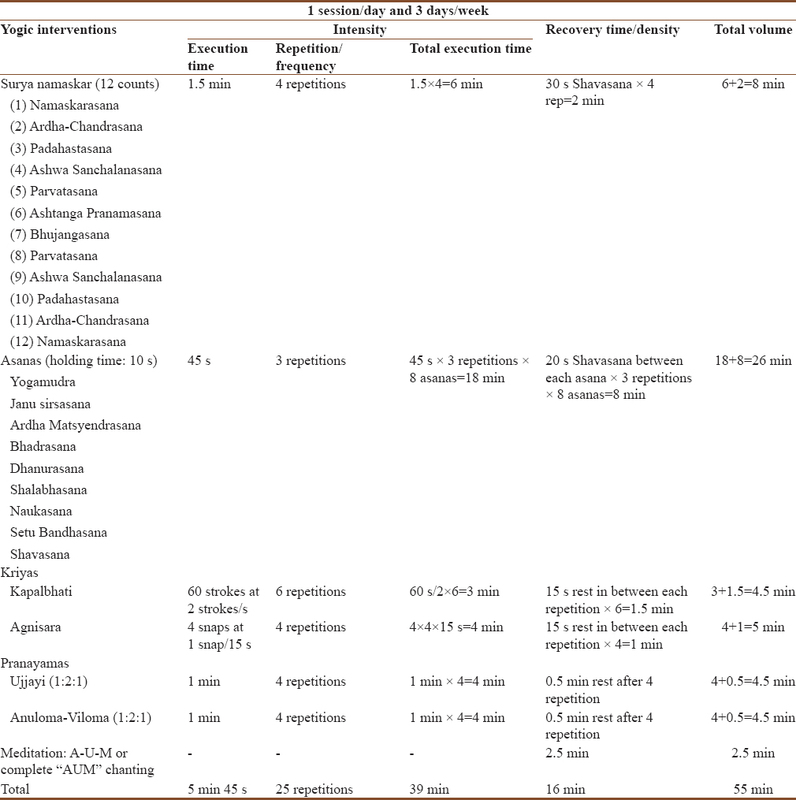 Effect of pranayama and yogasana in diabetes mellitus: A scientific review. J Complement Integr Med 2008;5:23-9. Mondal S, Kundu BN, Saha S. Blood sugar and lipid profile adaptations to yoga therapy. J Yoga Phys Ther 2014;4:1-4. Saha S. Effects of yogic practice on lipid profile in elderly women with type 2 diabetes mellitus. Indian J Res 2015;4:149-51. Sinha B, Ray US, Pathak A, Selvamurthy W. Energy cost and cardiorespiratory changes during the practice of Surya Namaskar. Indian J Physiol Pharmacol 2004;48:184-90. Kelley GA, Kelley KS. Effects of aerobic exercise on lipids and lipoproteins in adults with type 2 diabetes: A meta-analysis of randomized-controlled trials. Public Health 2007;121:643-55. Sahay BK. Proceedings of Novo Nordisk Diabetes Update. Bombay: Ed. Anil Kapur, Publ. Health Care Communications; 1994. Yoga and Diabetes. p. 159-67. Chandratreya S. Diabetes & Yoga. Diabetesyogaht; 2012. Available from: www.yogapoint.com/therapy/. [Last accessed on 2016 Sep 28]. Delmonte MM. 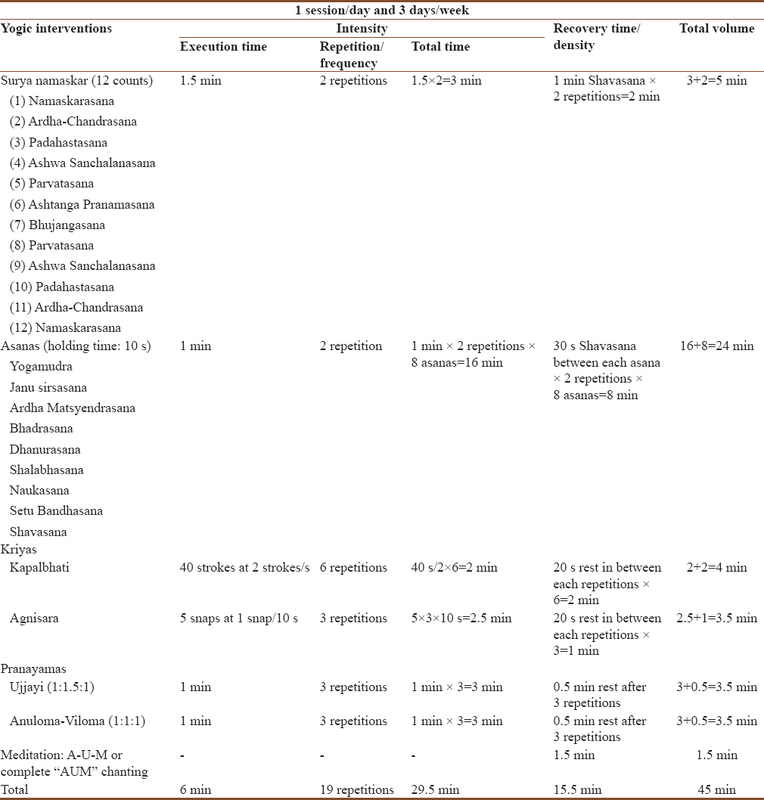 Biochemical indices associated with meditation practice: A literature review. Neurosci Biobehav Rev 1985;9:557-61.